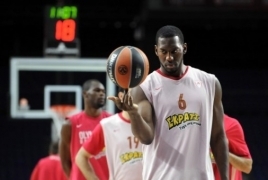 PanARMENIAN.Net - American professional basketball player Bryant Dunston has arrived in Armenia to prepare for a 2016 match at the FIBA European Championship For Small Countries. Bryant, 30, will play for the national basketball team at a Moldova-hosted match on June 28. The player was voted the Euroleague Best Defender of the season. “Dunston is currently in Yerevan and is determined to perform well with our team,” chief coach Tigran Gyokchyan said.